This announcement just in from Jane Webster of Hemmingbird lace. A full cruise to Norway with lace classes! Jane has been a lacemaking teacher since 1981 in the UK and Europe; see her website at http://tinyurl.com/nrwwl37 for schedules. For non lace making friends/crafters I will again be offering some craft options from my way back needlework teacher days. The materials for these will be free of charge but you must book in on a tuition place. Yvonne (travel agent) will handle all bookings and monies. If you are keen to go contact her before the end of the month (August). As regular supporters of my courses and holidays this will secure you the price stated. 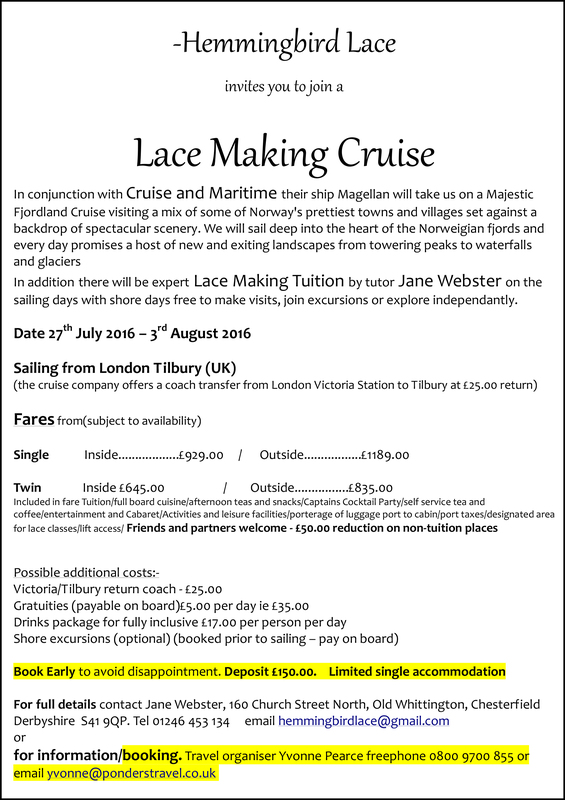 Bookings will still be taken later but can be subject to fluctuation from the cruise companies (We are trying to get them to hold the price until the Lace Guild advert goes out in October). Yvonne and I have done all we can to make this an easy, relaxed and fun experience. We hope it will be one you will remember. Do join us.